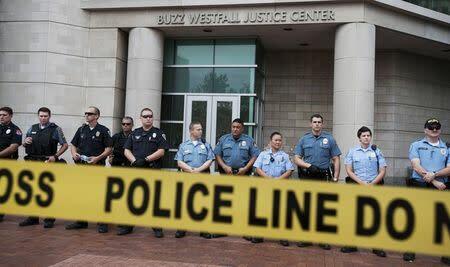 FERGUSON MISSOURI (Reuters) - Missouri authorities are drawing up contingency plans and seeking intelligence from U.S. police departments on out-of-state agitators, fearing that fresh riots could erupt if a grand jury does not indict a white officer for killing a black teen. The plans are being thrashed out in meetings being held two to three times a week, according to people who have attended them. The FBI said it was also involved in the discussions. Details of the meetings and intelligence sharing by Missouri police agencies and their counterparts around the country have not been reported before. The grand jury is expected to decide next month whether to bring criminal charges against police officer Darren Wilson, who shot dead Michael Brown, 18, on Aug. 9 in Ferguson, Missouri. In differing accounts, police have said Brown struggled with Wilson before the fatal shots were fired. But some witnesses say Brown held up his hands and was surrendering when he was shot multiple times in the head and chest. If charges are not brought against Wilson, police fear an outbreak of violence not just in the St. Louis suburb of Ferguson, but across the greater metropolitan area and even in other U.S. cities, according to St. Louis County Police Chief Jon Belmar and others involved in the planning meetings. James Knowles, the Ferguson mayor who has attended the meetings, told Reuters the concern is "the unrest is going to be far beyond the city of Ferguson." A memorial to Brown on the spot where he died, and where his body lay uncollected for four hours, still stands, a crucifix surrounded by teddy bears, photographs, flowers and handwritten notes decrying his loss and the alleged brutality of police. 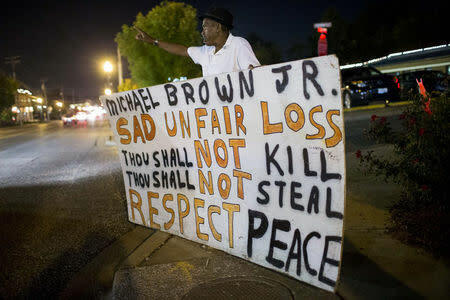 Brown's killing sparked days of protests in Ferguson in August and looting that caused millions of dollars of property damage. Police were sharply criticized for what was seen as a heavy handed response to the protests, firing tear gas and arresting hundreds of people. Protestors and civil rights groups say Brown's death is part of a national epidemic in which a disproportionately high number of unarmed black men are fatally shot by white police officers, an allegation police deny. Missouri law enforcement officials have been in contact with police chiefs in Los Angeles, New York, Florida and Cincinnati, Ohio and other jurisdictions as they prepare for the grand jury decision, Belmar said. Police in New York and Los Angeles did not return calls for comment. 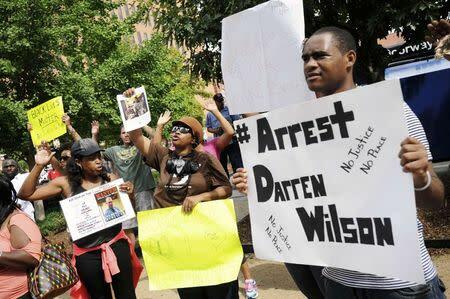 Of the 227 people arrested between Aug. 10 and Sept. 9 in connection with protests over Brown's death, 36 were from outside Missouri, including seven from New York, 12 from Illinois and five from California, according to arrest records provided by the St. Louis county police. "We know outside groups visited us in August. We are expecting that different people will come in from outside the St. Louis area," if the grand jury decides not to indict Wilson, Belmar said. One focus of the meetings has been on how to respond in the event of riots, the police chief said. Police faced a public backlash when they initially deployed armored carriers and carried military-style assault rifles after Brown's shooting. Representatives of the Missouri State Highway Patrol, St. Louis County Police, St. Louis city police and Ferguson police have been attending the meetings, Belmar said. The top FBI official in St. Louis, Agent William Woods, attended a strategy meeting last week, said St. Louis FBI spokeswoman Rebecca Wu. Plans have not been finalized. It was announced last week that the St. Louis County Police will take the lead from the tiny Ferguson force in patrolling the city's streets. The contingency planning comes as black and white residents of Ferguson brace for the grand jury decision. The nine white and three black jurors have heard evidence from dozens of witnesses, including Wilson, who has been under police protection at an undisclosed location since the shooting, said Bob McCulloch, the chief St. Louis county prosecutor overseeing the grand jury proceedings. At Ferguson Market and Liquor, where Brown appears on a surveillance video pushing a store clerk before walking out with an unpaid box of cigarillos on the morning of his death, most of the storefront windows have been repaired after being shattered in looting. In August, after Brown was shot, the mood inside the store was fearful. Today, it is one of defiance. One of the workers, who asked not to be named, said he had brought his handgun from home to keep in the store. "I'm ready to shoot anyone looking for trouble," he said. Many African Americans in Ferguson seem to have little faith in the grand jury process and expect Wilson will not be charged. It is rare for a U.S. police officer to face criminal charges after shooting a citizen in the line of duty. "I do believe if Darren Wilson is not indicted you will see a lot of carnage ... There is a lot of explosive energy," said Tef Poe, one of the protest leaders, sitting in a makeshift office close to where Brown was shot. On a wall sits an array of "to do" notes, top of which reads: "Find Darren Wilson". Poe, a rapper, was born and raised in St. Louis. His real name is Kareem Jackson. At a rally held by Black Lawyers for Justice in a Ferguson church last week, eight members of the New Black Panther Party, a black political group, provided security. They were wearing battle fatigues and berets. "We are tired of dead bodies in our community," Mauricelm-Lei Millere, an advisor to the New Black Panthers, shouted at the audience. "We are not going to take it anymore."